The Guerrillero Heroico photo of Che Guevara by Alberto Korda. Guerrillero Heroico (English, "Heroic Guerrilla") is the name of Alberto Korda's celebrated photo of the Marxist revolutionary Che Guevara. It was taken on March 5, 1960, in Havana, Cuba, at a memorial service for victims of the La Coubre explosion. The photo was not published internationally until seven years later. 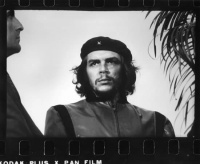 Korda has said that at the moment he shot the picture, he was drawn to Guevara's facial expression, which showed "absolute implacability" as well as anger and pain. Years later, Korda would say that the photo showed Che's firm and stoic character. Guevara was 31 at the time the photo was taken. Guerrillero Heroico (English, "Heroic Guerrilla fighter") is the name of Alberto Korda's celebrated photo of the Marxist revolutionary Che Guevara. It was taken on March 5, 1960, in Havana, Cuba, at a memorial service for victims of the La Coubre explosion and by the end of the 1960's turned the charismatic and controversial leader into a cultural icon. In 1967 Polish artist Roman Cieslewicz designed a poster with the words "Che Si" (translation: 'Yes Che') emblazoned over his face as eyes and nose. This was later featured on the October 1967 cover of the French art magazine Opus International. In 1968, Elena Serrano produced a widely distributed poster entitled "Day of the Heroic Guerrilla", which shows telescoping images of Korda's photograph expanding to cover the entire red map of South America. The 1968 February issue of Evergreen Review, featured Che's image in a painted form by Paul Davis. The September 1969 issue of Tricontinental Magazine featured an conjoined image of Korda's Che with Ho Chi Minh. During a 1969 student strike at Berkeley, a poster was produced and distributed with a cartoon bubble coming from Che's mouth possessing the words: "Shut it down!" In 1970, the Art Workers' Coalition produced a widely distributed anti-Vietnam War poster featuring an outline of Che on a yellow background, with his famous quotation: "Let me say at the risk of appearing ridiculous, that the true revolutionary is guided by great feelings of love." The September 16, 1996 edition of Der Spiegel magazine entitled: "The Myth of Che Guevara", featured Che's image adorned with a halo of moving bullets. A computerized rendition of Guerrillero Heroico appeared on the cover of the March 1-7, 2006 issue of Metro, above the title "The Blog Revolution." The December 2008 issue of Rolling Stone Argentina features Guerrillero Heroico on the cover. Unless indicated otherwise, the text in this article is either based on Wikipedia article "Guerrillero Heroico" or another language Wikipedia page thereof used under the terms of the GNU Free Documentation License; or on original research by Jahsonic and friends. See Art and Popular Culture's copyright notice. This page was last modified 21:00, 3 April 2014. This page has been accessed 3,509 times.